German climatologist and geophysicist who, in 1915, published as expanded version of his 1912 book The Origin of Continents and Oceans. This work was one of the first to suggest continental drift and plate tectonics. He suggested that a supercontinent he called Pangaea had existed in the past, broke up starting 200 million years ago, and that the pieces "drifted" to their present positions. He cited the fit of South America and Africa, ancient climate similarities, fossil evidence (such as the fern Glossopteris and mesosaurus), and similarity of rock structures. The American Frank Taylor had published a rather speculative paper suggesting continental drift in 1910 which, however, had attracted relatively little attention, as had previous such suggestions by Humboldt and Osmond Fisher. The book was translated to English in 1924, when in aroused hostile criticism. The proposal remained controversial until the 1960s, when it became widely accepted over a fairly short period of time. "Utter, damned rot!" said the president of the prestigious American Philosophical Society. "If we are to believe [this] hypothesis, we must forget everything we have learned in the last 70 years and start all over again," said another American scientist. Anyone who "valued his reputation for scientific sanity" would never dare support such a theory, said a British geologist. Thus did most in the scientific community ridicule the concept that would revolutionize the earth sciences and revile the man who dared to propose it, German meteorological pioneer and polar explorer Alfred Wegener. Science historians compare his story with the tribulations of Galileo. "Doesn't the east coast of South America fit exactly against the west coast of Africa, as if they had once been joined?" wrote Wegener to his future wife in December 1910. "This is an idea I'll have to pursue." The following fall Wegener came across scientific papers promoting the prevailing theory that Africa and South America had once been connected by a continent-size land bridge that had since sunk into the sea. They cited as evidence fossils of identical animals that had lived in both areas simultaneously hundreds of millions of years ago. Wegener was fascinated and searched out other papers about such continental coincidences. As he read, his earlier conjecture that the continents had once been joined became a conviction he would boldly champion for the rest of his life. Just a few months later, on January 6, 1912, Wegener startled a meeting of the Geological Association in Frankfurt with his radical theory. Dismissing the concept of sunken land bridges, he proposed instead a grand vision of drifting continents and widening seas to explain the evolution of Earth's geography. Four nights later he made a similar presentation to the Society for the Advancement of Natural Science in Marberg, Germany. Wegener had launched a revolution--and he knew it. Just two weeks earlier, he had written his future father-in-law, eminent climatologist Wladimir Koppen, "if it turns out that sense and meaning are now becoming evident in the whole history of the Earth's development, why should we hesitate to toss the old views overboard?" 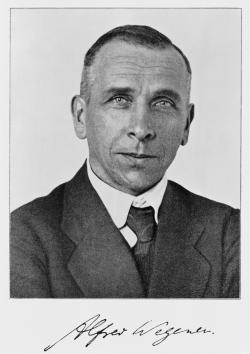 Alfred Wegener was born in Berlin on November 1, 1880. He studied the natural sciences at the University of Berlin, receiving a doctorate in astronomy in 1904. He did not pursue a career in astronomy, however, but turned instead to meteorology, where the telegraph, Atlantic cable, and wireless were fostering rapid advances in storm tracking and forecasting. In 1905 Wegener went to work at the Royal Prussian Aeronautical Observatory near Berlin, where he used kites and balloons to study the upper atmosphere. He also flew in hot air balloons; indeed, in 1906 he and his brother Kurt broke the world endurance record by staying aloft for more than 52 hours. Thanks to his upper-air work, Wegener was invited to join a 1906 Danish expedition to Greenland's unmapped northeast coast. He was thrilled: As a youth he had dreamed of exploring the Arctic, attracted by both the scientific and physical challenges. During this expedition Wegener became the first to use kites and tethered balloons to study the polar atmosphere. When he returned to Germany, Wegener's Arctic research earned him a position at the small University of Marberg where, beginning in 1909, he lectured on meteorology, astronomy, and "astronomic-geographic position-fitting for explorers." Both students and professors were impressed by the clarity of the young meteorologist's thinking, by his ability to explain difficult concepts in simple terms, and by the intuitive leaps of his nimble mind. "With what ease he found his way through the most complicated work of the theoreticians, with what feeling for the important point!" a somewhat-awed colleague, physics professor Hans Benndorf, would later write. "He would often, after a long pause for reflection, say 'I believe such and such' and most times he was right, as we would establish several days later after rigorous analysis." In 1911, still only 30, Wegener collected his meteorology lectures into a book, The Thermodynamics of the Atmosphere, which soon became a standard text throughout Germany. After reading it, the distinguished Russian climatologist Alexander Woeikoff wrote that a new star had risen in meteorology. In 1912, the year of his continental-drift presentations, Wegener again answered the siren call of Greenland. His four-man expedition "escaped death only by a miracle" while climbing a suddenly calving glacier on the northeast coast, then became the first to overwinter on the ice cap. The following spring, they barely survived the longest crossing of the great ice sheet ever made, traversing 750 miles of barren snow and ice rising to heights of 10,000 feet. During these perilous adventures, Wegener collected volumes of unique scientific data. The resulting publications established him as one of the world's leading experts on polar meteorology and glaciology. According to fellow meteorologist and Greenland explorer Dr. Johannes Georgi, Wegener was the first to trace storm tracks over the ice cap. When he returned to Marberg, Wegener resumed work on continental drift, marshaling all the scientific evidence he could find to support his theory. "One day a man visited me whose fine features and penetrating blue-gray eyes I was unable to forget," the great German geologist Hans Cloos later recalled. "He spun out an extremely strange train of thought about the structure of the Earth and asked me whether I would be willing to help him with geological facts and concepts." Using this pioneering interdisciplinary approach, Wegener wrote one of the most influential and controversial books in the history of science: The Origin of Continents and Oceans, published in 1915. Because of the First World War, Wegener's book went unnoticed outside Germany. In 1922, however, a third (revised) edition was translated into English, French, Russian, Spanish, and Swedish, pushing Wegener's theory of continental drift to the forefront of debate in the Earth sciences. Wegener began by demolishing the theory that large land bridges had once connected the continents and had since sunk into the sea as part of a general cooling and contraction of the Earth. He pointed out that the continents are made of a different, less dense rock (granite) than the volcanic basalt that makes up the deep-sea floor in which Wegener proposed that the continents floated somewhat like icebergs in water. Wegener also noted that the continents move up and down to maintain equilibrium in a process called isostasy. As an example he cited the sinking of Northern Hemisphere lands under the weight of continental ice sheets in the last ice age, and their rise since the ice melted some 10,000 years ago. Given the difference in density between continents and sea floor, plus the process of isostasy, Wegener reasoned that if continent-size land bridges had existed and somehow been forced to the ocean bottom, they would have "bobbed-up" again when the force was released. Therefore, since fossil and geological evidence clearly showed the continents were once connected, the only logical alternative was that the continents themselves had been joined and had since drifted apart. Wegener also offered a more plausible explanation for mountain ranges. According to the cooling, contracting-Earth theory, they formed on the Earth's crust as wrinkles form on the skin of a drying apple. If this were so, however, they should be spread evenly over the Earth; instead mountain ranges occur in narrow bands, usually at the edge of a continent. Wegener said they formed when the edge of a drifting continent crumpled and folded--as when India hit Asia and formed the Himalayas. He also noted that when you fit Africa and South America together, mountain ranges (and coal deposits) run uninterrupted across both continents, writing: "It is just as if we were to refit the torn pieces of a newspaper by matching their edges and then check whether the lines of print ran smoothly across. If they do, there is nothing left but to conclude that the pieces were in fact joined in this way." By his third edition (1922), Wegener was citing geological evidence that some 300 million years ago all the continents had been joined in a supercontinent stretching from pole to pole. He called it Pangaea (all lands), and said it began to break up about 200 million years ago, when the continents started moving to their current positions. Perhaps the best summary of Wegener's revolutionary theory was provided by countryman Hans Cloos: "It placed an easily comprehensible, tremendously exciting structure of ideas upon a solid foundation. It released the continents from the Earth's core and transformed them into icebergs of gneiss [granite] on a sea of basalt. It let them float and drift, break apart and converge. Where they broke away, cracks, rifts, trenches remain; where they collided, ranges of folded mountains appear." Except for a few converts, and those like Cloos who couldn't accept the concept but was clearly fascinated by it, the international geological community's reaction to Wegener's theory was militantly hostile. American geologist Frank Taylor had published a similar theory in 1910, but most of his colleagues had simply ignored it. Wegener's more cogent and comprehensive work, however, was impossible to ignore and ignited a firestorm of rage and rancor. Moreover, most of the blistering attacks were aimed at Wegener himself, an outsider who seemed to be attacking the very foundations of geology. Because of this abuse, Wegener could not get a professorship at any German university. Fortunately, the University of Graz in Austria was more tolerant of controversy, and in 1924 it appointed him professor of meteorology and geophysics. In 1926 Wegener was invited to an international symposium in New York called to discuss his theory. Though he found some supporters, many speakers were sarcastic to the point of insult. Wegener said little. He just sat smoking his pipe and listening. His attitude seems to have mirrored that of Galileo who, forced to recant Copernicus' theory that the Earth moves around the sun, is said to have murmured, "Nevertheless, it moves!" Scientifically, of course, Wegener's case was not as good as Galileo's, which was based on mathematics. His major problem was finding a force or forces that could make the continents "plow around in the mantle," as one critic put it. Wegener tentatively suggested two candidates: centrifugal force caused by the rotation of the Earth, and tidal-type waves in the Earth itself generated by the gravitational pull of the sun and moon. He realized these forces were inadequate. "It is probable the complete solution of the problem of the forces will be a long time coming," he predicted in his last (1929) revision. "The Newton of drift theory has not yet appeared." Wegener noted, however, that one thing was certain: "The forces that displace continents are the same as those that produce great fold-mountain ranges. Continental drift, faults and compressions, earthquakes, volcanicity, [ocean] transgression cycles and [apparent] polar wandering are undoubtedly connected on a grand scale." Wegener's final revision cited supporting evidence from many fields, including testimonials from scientists who found his hypothesis resolved difficulties in their disciplines much better than the old theories. Climatology was one such discipline. Fossils and geologic evidence show that most of the continents used to have startlingly different climates than they do today. Wegener thought continental drift was the key to these climatic puzzles, so he and Vladimir Koppen plotted ancient deserts, jungles, and ice sheets on paleogeographic maps based on Wegener's theory. Suddenly the pieces of the puzzles fell into place, producing simple, plausible pictures of past climates. Evidence of the Permo-Carboniferous ice-age era that peaked some 280 million years ago, for example, was scattered over almost half the Earth, including the hottest deserts. On Wegener's map, however, it clustered neatly around the South Pole--because Africa, Antarctica, Australia, and India had once comprised a Southern Hemisphere supercontinent (Gondwanaland). Wegener considered such paleoclimatic validation one of the strongest proofs of his theory. Conversely, continental drift has since become the organizing principle of paleoclimatology and other paleosciences. Unfortunately, though Wegener's explanation of the Permo-Carboniferous ice age impressed even his critics, the merit of much of the rest of his supporting evidence was not widely recognized at the time. As a result, most geologists eventually dismissed his theory as a fairy tale or "mere geopoetry." Despite general rejection, Wegener's compelling concept continued to attract a few advocates over the next several decades. Then, beginning in the mid-1950s, a series of confirming discoveries in paleomagnetism and oceanography finally convinced most scientists that continents do indeed move. Moreover, as Wegener had predicted, the movement is part of a grand scale process that causes mountain-building, earthquakes, volcanic eruptions, sea-level fluctuations, and apparent polar wandering as it rearranges Earth's geography. Geologists call the process "plate tectonics," after the large moving plates that form the planet's outer shell. These plates carry both continents and sea floor, but unlike the sea floor, the less-dense, buoyant continents resist subduction into the mantle. Thus, despite significant differences in detail, Alfred Wegener was right in most of his major concepts. Plate tectonics also confirms the accuracy of many of his paleogeographic reconstructions. Ironically, though the lack of a credible driving force was the main objection to Wegener's theory, plate tectonics has been almost universally accepted despite the absence of scientific consensus as to its cause. Convection currents in the molten magma of the upper mantle are the favorite candidates; Wegener discussed this possibility in his 1929 revision. During the last few decades, Alfred Wegener has finally gotten the recognition he deserves. Unfortunately, as with most visionaries, it must be posthumous praise. 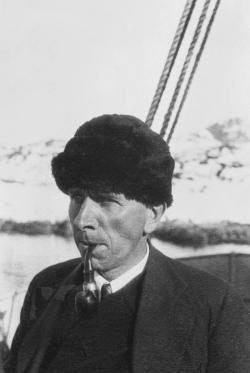 Wegener returned to his beloved Greenland in the spring of 1930 as the leader of 21 other scientists and technicians. They were to systematically study the great ice cap and its climate. To carry out this ambitious program, Wegener planned to establish three observation posts at latitude 71 degrees N, one on the western edge of the ice, one on the eastern edge, and one at mid-ice. From the beginning, things went badly. Though the main party arrived in western Greenland on April 15, harbor ice hung on stubbornly until June 17, when they were finally able to land their 98 tons of supplies at the base of the ice cap. They were already 38 days behind schedule when they began to move up onto the ice cap to set up the western camp. Because of unusually frequent bad weather, only a fraction of the supplies meteorologist Georgi and glaciologist Ernest Sorge would need for the harsh Greenland winter reached Eismitte in the next month and a half. Even the hut they were to live in and their radio transmitter didn't get through. Wegener had earlier written his brother Kurt of the polar explorer's "obligation to be a hero." This was doubly true for an expedition leader, so on September 21 Wegener himself led a 15-dogsled run to relieve Eismitte. 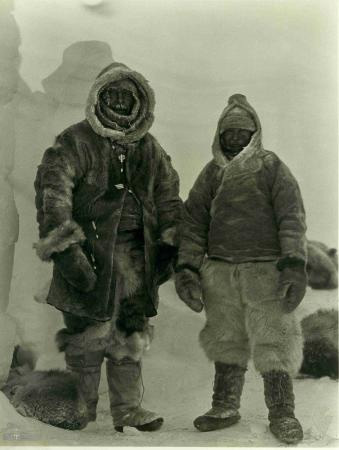 He was accompanied by fellow meteorologist Fritz Lowe and 13 Greenlanders. Because of poor snow conditions and bad weather, however, they covered only 38.5 miles the first seven days. Wegener wrote it was now "a matter of life and death" for his friends at Eismitte. As the relief party continued to struggle eastward, all but one of the Greenlanders gave up and returned to the base camp. Wegener and his two remaining companions finally reached Eismitte on October 30, after traveling 40 days. For the last five days temperatures had averaged -58 degrees F and a constant, frigid wind had blown in their faces. At Eismitte, the travelers were delighted to find that Georgi and Sorge had been able to dig an ice cave for shelter; moreover, they thought they could stretch their supplies through the winter. The heroic rescue run had been unnecessary, but there had been no way to let Wegener know. Fritz Lowe was exhausted and his feet and fingers were badly frostbitten. Wegener, on the other hand, "looked as fresh, happy and fit as if he had just been for a walk," marveled Ernst Sorge. "He was fired with enthusiasm and ready to tackle anything." Rasmus Villumsen, the 22-year-old Greenlander who had accompanied them, was also in good shape. Two days later, on November 1, the group gaily celebrated Wegener's 50th birthday. Then, because supplies were short and Fritz Lowe had to stay to recuperate, Wegener and Rasmus Villumsen, the wind now at their backs, set off confidently for the coast. Their friends would never see them alive again. When Wegener, Lowe, and Villumsen failed to return, those at the base camp assumed they had decided to overwinter at Eismitte. When April came with no word, however, they sent out a search party to make sure. Some 118 miles inland the searchers came upon a pair of skis stuck upright in the snow, with a broken ski pole lying between them. They dug around, but found only an empty box. Puzzled, they went on to Eismitte, but when they heard Wegener and Villumsen had left six months before, they hurried back to make a more thorough search. On May 12, 1931, they found Wegener's body. It was fully dressed and lying on a reindeer skin and sleeping bag stitched into two sleeping bag covers. Wegener's eyes were open, and the expression on his face was calm and peaceful, almost smiling. Apparently he died while lying in his tent. His friends thought Wegener probably suffered a heart attack brought on by the tremendous exertion of trying to keep up with the dogsled on skis over rough terrain. Rasmus Villumsen obviously buried Wegener with great care and respect, then presumably pressed on for the base camp, only to disappear into the white wilderness. Though a long, exhaustive search was made, the faithful Greenlander's body was never found. Wegener's friends left his body as they found it and built an ice-block mausoleum over it. Later they erected a 20-foot iron cross to mark the site. All have long since vanished beneath the snow, inevitably to become part of the great glacier itself. It is a most fitting resting place for this remarkable man who devoted so much of his life to the study of that remnant of the last ice age and whose vision of moving continents provided the key to the mysteries of more ancient glacial epochs. Koppen, Vladimir and Alfred Wegener. The Climates of the Geological Past. London: D. Van Nostrand, 1863. Miller, Russell. Continents in Collision. Alexandria, VA: Time/Life Books, 1983. Schwarzbach, Martin. Alfred Wegener: The Father of Continental Drift. Carla Love, translator. Madison, WI: Science Tech, 1986. Wegener, Alfred. The Origin of Continents and Oceans. John Biram, translator. Mineola, NY: Dover Publications, 1966. Wegener, Else, editor. Greenland Journey: The Story of Wegener German Expedition in 1930-31, as told by members of the exposition and the leader's diary. Winifred M. Deans, translator. Glasgow: Blackie & Son, 1939. PATRICK HUGHES is a former managing editor of Weatherwise. "The Meteorologist Who Started a Revolution,"Weatherwise 47 (April/May 1994) 29-35. "I freely admit that in formulating the theory [of raindrop formation] I drew quite a lot on Alfred Wegener's ideas." When Tor Bergeron acknowledged his debt to Alfred Wegener he spoke for all meteorologists. Wegener is not only the father of the theory of continental drift, he was the first to describe the process (now called the Wegener-Bergeron-Findeisen procedure) by which most raindrops form, and he also explained two rare ice crystal halo arcs that bear his name as well. During Wegener's lifetime the process by which cloud particles reach raindrop size was not known, but there was some idea how much rain, even during summer, began as snow in the clouds. In 1784, Benjamin Franklin had suggested this, and in 1904, Wilson A. Bentley, who spent a lifetime studying snow crystals and raindrops, found supporting evidence for the conjecture. Wegener invoked a subtle physical idea in his theory of raindrop formation. In his 1911 classic, The Thermodynamics of the Atmosphere, he noted that ice crystals invariably grow at the expense of supercooled droplets because the crystals have a lower equilibrium vapor pressure. He then suggested that raindrops might result from this competition between ice crystals and supercooled cloud droplets. Wegener hoped to document this process in real clouds, but other projects intervened and he never returned to the subject. Thus, it was left to Tor Bergeron and W. Findeisen develop and prove the theory in the 1930s. Ice crystals also figured in Wegener's second namesake. Ice crystals often form in the frigid air just above the Greenland ice cap and can produce spectacular halos. In a 1926 article, Wegener explained two relatively rare arcs that appear opposite the sun and are now named in his honor. View images of original documents and photographs from the expeditions. "This virtual exhibition sheds light on Alfred Wegener's [four] expeditions to Greenland between 1906 and 1931. Its main focus is on the diaries Wegener wrote during his explorations, which offer unique insights into the manifold challenges man and material faced in Greenland's extreme environments. You may choose to read the diaries in their original state, or browse the expeditions individually and read transcribed and translated excerpts by clicking on the tabs." The Alfred Wegener Institute carries out research in the Arctic and Antarctic as well as in the high and mid latitude oceans. The institute coordinates German polar research and makes available to national and international science important infrastructure, e.g. the research icebreaker �Polarstern� and research stations in the Arctic and Antarctic.